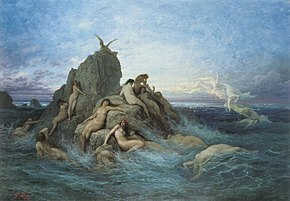 This article is about Greek mythological sea nymphs. For the tone poem by Sibelius, see The Oceanides. In Greek mythology, the Oceanids or Oceanides (/oʊˈsiːənɪdz, ˈoʊʃənɪdz/; Ancient Greek: Ὠκεανίδες, pl. of Ὠκεανίς) are the nymphs who were the three thousand (a number interpreted as meaning "innumerable") daughters of the Titans Oceanus and Tethys. The Oceanids' father Oceanus was the great primordial world-encircling river, their mother Tethys was a sea goddess, and their brothers the Potamoi (also three thousand in number) were the personifications of the great rivers of the world. Like the rest of their family, the Oceanid nymphs were associated with water, as the personification of springs. Hesiod says they are "dispersed far and wide" and everywhere "serve the earth and the deep waters", while in Apollonius of Rhodes' Argonautica, the Argonauts, stranded in the desert of Lybia, beg the "nymphs, sacred of the race of Oceanus" to show them "some spring of water from the rock or some sacred flow gushing from the earth". The Oceanids are not easily categorized, nor confined to any single function, not even necessarily associated with water. Though most nymphs were considered to be minor deities, many Oceanids were significant figures. Metis, the personification of intelligence, was Zeus' first wife, whom Zeus impregnated with Athena and then swallowed. The Oceanids Amphitrite and Doris, like their mother Tethys, were important sea-goddess. While their brothers, the Potamoi, were the usual personifications of major rivers, Styx (according to Hesiod the eldest and most important Oceanid) was also the personification of a major river, the underworld's river Styx. And some, like Europa, and Asia, seem associated with areas of land rather than water. The Oceanids were also responsible for keeping watch over the young. According to Hesiod, who described them as "neat-ankled daughters of Ocean ... children who are glorious among goddesses", they are "a holy company of daughters who with the lord Apollo and the Rivers have youths in their keeping—to this charge Zeus appointed them"
Like Metis, the Oceanids also functioned as the wives (or lovers) of many gods, and the mothers, by these gods, of many other gods and goddesses. Doris was the wife of the sea-god Nereus, and the mother of the fifty sea nymphs, the Nereids. Stix was the wife of the Titan Pallas, and mother the mother of Zelus, Nike, Kratos, and Bia. Eurynome, Zeus' third wife, was the mother of the Charites. Clymene was the wife of the Titan Iapetus, and mother of Atlas, Menoetius, Prometheus, and Epimetheus. Electra was the wife of the sea god Thaumas and the mother of Iris and the Harpies. Other notable Oceanids include: Perseis, wife of the Titan sun god Helios and mother of Circe, and Aeetes the king of Colchis; Idyia, wife of Aeetes and mother of Medea; and Callirhoe, the wife of Chrysaor and mother of Geryon. As a group, the Oceanids form the chorus of the tragedy Prometheus Bound, coming up from their cave beneath the ground, to console the chained Titan Prometheus. They were also the companions of Persephone when she was abducted by Hades. Hesiod gives the names of 41 Oceanids, with other ancient sources providing many more. While some were important figures, most were not. Some were perhaps the names of actual springs, others merely poetic inventions. Some names, consistent with the Oceanids' charge of having "youths in their keeping", represent things which parents might hope to be bestowed upon their children: Plouto ("Wealth"), Tyche ("Good Fortune"), Idyia ("Knowing"), and Metis ("Wisdom"). Others appear to be geographical eponyms, such as Europa, Asia, Ephyra (Corinth), and Rhodos (Rhodes). Several of the names of Oceanids were also among the names given to the Nereids. Sailors routinely honoured and entreated the Oceanids, dedicating prayers, libations and sacrifices to them. Appeals to them were made to protect seafarers from storms and other nautical hazards. Before they began their legendary voyage to Colchis in search of the Golden Fleece, the Argonauts made an offering of flour, honey and sea to the ocean deities, sacrificed bulls to them and entreated their protection from the dangers of their journey. Jean Sibelius wrote an orchestral tone poem called Aallottaret (The Oceanides) in 1914. The Manchester-born painter Annie Swynnerton, the first woman to be admitted to the Royal Academy in 1922, painted a work called Oceanid some time before 1908. It shows a strong, unidealised female figure at one with nature, typical of Swynnerton's many depictions of 'real' women and her feminist politics. ^ Hard, pp. 40–41; Tripp, s.v. Oceanids, p. 401; Grimal, s.v. Oceanus, p. 315. ^ Apollonius of Rhodes, Argonautica 9.1410–4118. ^ Tripp, s.v. Oceanids, p. 401. ^ Hard, p. 40; West, p. 260. ^ Hesiod, Theogony 886–900; Apollodorus, 1.3.6. ^ Tripp, s.v. Oceanids, p. 401; Hesiod, Theogony 361. ^ Fowler, pp. 13–14; Tripp, s.v. Oceanids, p. 401. ^ Hard, p. 40; Larson, p. 30; Gantz, p. 28; Tripp, s.v. Oceanids, p. 401. ^ Grimal, s.v. Oceanus, p. 315. Larson, p. 7 says that the Oceanids "serve mainly as genealogical starting points". ^ Hesiod, Theogony 907–909; Apollodorus, 1.3.1. Other sources give the Charites other parents, see Smith, s.v. Charis. ^ Hesiod, Theogony 351, however according to Apollodorus, 1.2.3, another Oceanid, Asia was their mother by Iapetus. ^ Hesiod, Theogony 266–269; Apollodorus, 1.2.6. ^ Hard, p. 41; Gantz, p. 30; Aeschylus, Prometheus Bound 128–135. ^ Fowler, p. 13; Larson, p. 7; Homeric Hymn to Demeter (2), 2.5, 2.418–423. ^ Kemp, s.v. Oceanids, p. 611. Aeschylus (? ), Prometheus Bound in Aeschylus, with an English translation by Herbert Weir Smyth, Ph. D. in two volumes. Vol 2. Cambridge, Massachusetts. Harvard University Press. 1926. Online version at the Perseus Digital Library. Fowler, R. L., Early Greek Mythography: Volume 2: Commentary, Oxford University Press, 2013. ISBN 978-0198147411. Homeric Hymn to Demeter (2), in The Homeric Hymns and Homerica with an English Translation by Hugh G. Evelyn-White, Cambridge, Massachusetts., Harvard University Press; London, William Heinemann Ltd. 1914. Online version at the Perseus Digital Library. Kemp, Peter (1979). The Oxford Companion to Ships & the Sea. Oxford University Press. ISBN 978-0-586-08308-6. Most, G.W., Hesiod: Theogony, Works and Days, Testimonia, Loeb Classical Library, No. 57, Cambridge, Massachusetts, 2006 ISBN 978-0-674-99622-9. Online version at Harvard University Press. West, M. L., Hesiod: Theogony, Oxford University Press, 1966. ISBN 0-19-814169-6.